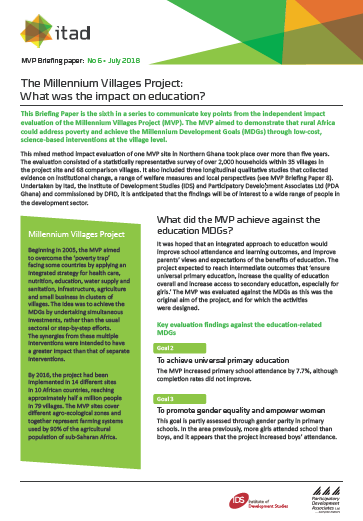 This Briefing Paper is the sixth in a series to communicate key points from the independent impact evaluation of the Millennium Villages Project (MVP). The MVP aimed to demonstrate that rural Africa could address poverty and achieve the Millennium Development Goals (MDGs) through low-cost, science-based interventions at the village level. It was hoped that an integrated approach to education would improve school attendance and learning outcomes, and improve parents’ views and expectations of the benefits of education. The project expected to reach intermediate outcomes that ‘ensure universal primary education, increase the quality of education overall and increase access to secondary education, especially for girls.’ The MVP was evaluated against the MDGs as this was the original aim of the project, and for which the activities were designed.